100% wild-caught fish breaded in a crunchy, golden panko coating. Always crunchy, never fried. 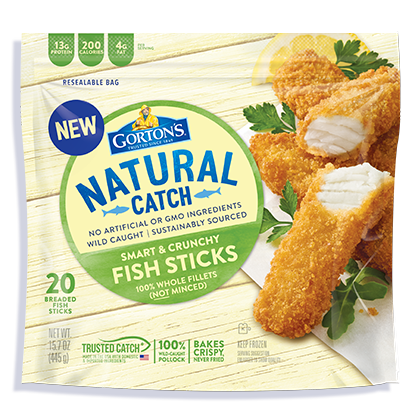 We cut out all the artificial stuff, then we cut our Smart & Crunchy Fish Sticks from 100% sustainably wild-caught fillets and bread them in a crunchy, golden panko coating. What you’re left with is a 100% delicious Fish Stick. 3. Arrange on metal baking pan. 4. Bake 24 - 26 minutes total. * Flip after 16 minutes. Wheat flour, water, whole wheat flour, palm oil, yellow corn flour, sugar, sea salt, natural flavor, garlic powder, onion powder, yeast, salt, xanthan gum, whey, acacia gum.